List of Documents to be Produced for APDEECET 2019 Certificates Verification, Instructions: Already the #APDEECET 2019notificationfor Admission into D.El.Ed course released and entrance test also completed recently. DEECET Convenor issuedguidelines for Web Options. The First stage is Online submission of preference of colleges process will be started and after Second phase will be started as per schedule. In this First stage, First phase web options given candidates will download their Provisional Admission Letter (Allotment of Seat) and they will attend certificate verification at district level. Finally, DEECET officials will issue the Final Admission Letter to the Selected Candidates after verification of Certificates. 1. You must read the your PAL three or more times line by line. 2. You Should attend the Certificates Verification withe Required List Of Documents at your Allotted College of District's Government DIET College, this is mentioned in your Provisional Admission Letter. 3. Fee will also important for pay at the time of Verification. So, Candidates should pay the prescribed fee after verification. So, you must join your allotted college after verification of certificates. Later you can also participate in II Phase counselling as per the same process of I Phase. Next step is that "Certificate Verification" For certificate verification you have to carry the following certificates. 1. 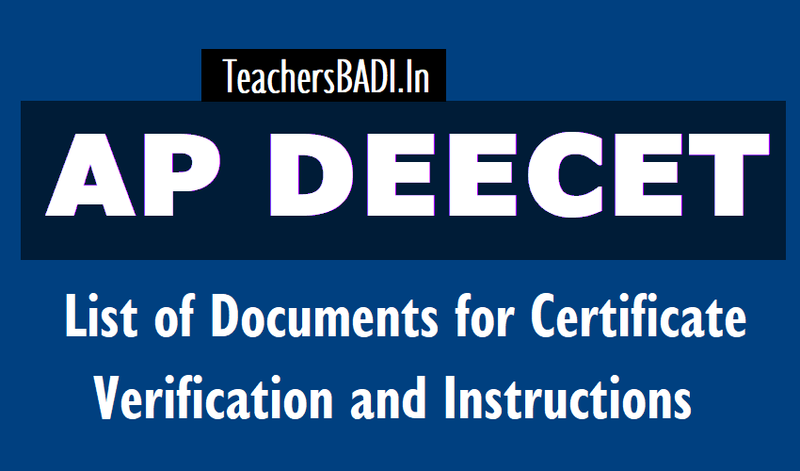 Pdf of ONLINE application of DEECET 2019. 2. Rank Card of AP DEECET 2019(Rank card(Your name in the Merit List of Page) or If you not found Merit List, You can get from Results on AP DEECET Website). 9. Special Category certificates issued by concerned authority for candidates claiming admission under quota of reservation for Special Categories(CAP, NCC, Sports,). 10. Income certificate issued by Tahsildhar after 01.01.2014 of parent/s of SC & ST candidates whose income is less than Rs.2,00,000 per annum from all sources and Rs.1,00,000 in respect of BC candidates claiming exemption of Tuition fee (Rs.2385.00 in case of Colleges under Governmen Management and Tuition fee Rs.11000.00 in case of Colleges under Private Management for One year). Next the real test is attending the counselling. Follow these tips while attending counselling. 4. Confirm the counselling time of your rank. 5. You have to stay very early before your counselling states because you can get an idea of places of colleges. 6. Keep an idea to reach the venue of counselling. Candidate should without fail attend to the session for verification of certificates on the above shown dates. Otherwise this Provisional Admission letter stands cancelled and the vacancies that arise in such cases will be considered for candidates who follow them in the merit list during the second phase of web based selection of colleges for admission. Any request for consideration of admission after being absent for the session for verification of certificates during the prescribed time will not be entertained. Issue of this Provisional admission letter is based on the particulars of candidate submitted by them in their ONLINE application and on the State Rank secured by her / him. Hence, if the candidate fails to produce any of the relevant documents (as listed in the Provisional admission letter) in support of the claim for admission her / his admission stands cancelled. Candidates shall maintain strict discipline during the session for verification of certificates. Any candidate who obstructs the session or misbehaves or causes disturbance as to whatsoever will be subject to disciplinary action as per rules. If any candidate who is given admission during the first phase of web based selection of colleges wants to shift to any other college based on the vacancy list after first phase they can apply for the same during the second phase of web based selection of colleges.